Where did Thomas get his diesel blood? It did not run in the family. He started as a welder. After two flash burns and a doctor-prescribed career change, Thomas received his first taste for driving with a boom truck. Then came the day with the CMV. Thomas was out with his wife (then girlfriend), when a commercial truck drove by. “You’re not a real truck driver until you drive one of those,” she said. After 3 weeks of training, Thomas was behind the wheel of an 18-wheeler. Thomas loves being a driver because he loves helping people. This is why he is safety conscious. After witnessing a bad wreck on the highway, Thomas became a safety crusader. “I used to tell other drivers to stop tailgating over the CB,” he confessed. Becoming a TransAm mentor was the natural next step; he wanted to teach other drivers to be safe while over-the-road. “Trucking is not just another job. It’s a lifestyle – not just for the driver but for the [driver’s] family as well.” When you create safe drivers, you “make sure drivers get home.” This is not just important to the drivers, but their families as well. “Don’t disappoint the family.” They are counting on their drivers to come home. TransAm worked with Thomas to make sure he came home safely every time. Thomas decided to move from a truck to an office when his son was born. But the diesel had infected him now, and he did not want to leave TransAm Trucking. When asked why, he said, “Other companies tried to recruit me, but I liked being treated like a person instead of a number.” From Day One, Thomas has been on a first name basis with TransAm’s owner, Johnny Jacobson. During Thomas’s Orientation, Johnny introduced himself to all the new drivers, shook hands, and asked for their names. 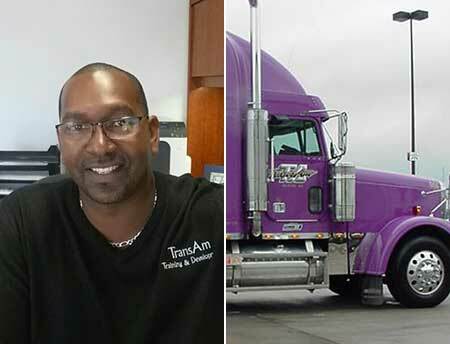 That personal touch made a lasting impression on Thomas and he continues that legacy today with every driver who comes through TransAm Trucking’s Orientation. Truck drivers are important, they are part of a noble profession, and Thomas makes sure they know it. It’s in his blood.